Princess Penelope flies by on a unicorn. "The Ned-liest Catch", also titled "Nedliest Catch", is the twenty-second episode and season finale of season 22. It originally aired on May 22, 2011. "Feeling guilty for getting Mrs. Krabappel suspended after one of his school pranks, Bart helps her escape detention, and Ned Flanders winds up saving her life in the process. When Edna and Ned start dating, he is surprised to learn she’s been with many of Springfield's men, including Homer and Aerosmith drummer Joey Kramer (guest-voicing as himself)." At a girls basketball rally celebrating their first basket in a triple overtime game against Shelbyville, Bart causes trouble for the school. Edna grabs Bart and slaps him twice in front of the school. Edna soon has to face a meeting with she's confronted by Seymour Skinner, Superintendent Chalmers, Homer, and Marge in Skinner's office. Edna is suspended with pay, but she must go to a holding area until her hearing. After guilt gets the best of him, Bart goes to the building to free Edna. However, during the escape, Edna almost fall off the ladder but Ned happens to walk by and save her. Edna begins to talk about the Simpsons with Ned, and the couple soon starts to date. This causes much grief for Bart, as his teacher now constantly visits the house next door, making it hard for him to get away with slacking. Edna then gives Flanders the courage to ask for his stuff back from Homer, emptying the Simpsons' garage. Homer then tries to break up Nedna, but in talking realizes that he wants Ned to be happy. He then accidentally goads the guys at Moe's into talking about their numerous sexual exploits with Edna, causing Ned to question the relationship which worsens when he sees several of Edna's ex-boyfriends (and one ex-girlfriend) on her face causing him the run out of her apartment. Homer convinces Flanders to go back to Edna, and she agrees to be with him on the condition that her past never gets in their way again. Ned comments on how that will have to be decided by a "higher power". Thus the show ends on a cliffhanger, with Homer and Marge asking the fans to decide, making the second time fans take part in an episode since the two-part "Who Shot Mr. Burns?" saga. In re-runs, as the closing credits roll, Marge tells the fans that if they're watching a re-run or a DVD, it's too late to vote, and Homer berates them for not taking the opportunity earlier. 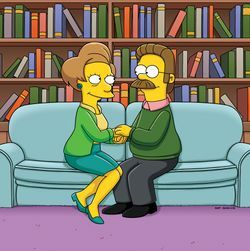 With this episode, FOX launched a contest that changed the lives of two characters: visitors to thesimpsons.com were invited to vote on the future of Ned's and Edna's relationship. The results were revealed in the 23rd season premiere, "The Falcon and the D'ohman". This is the second interactive episode of "The Simpsons", the first being "Who Shot Mr. Burns?" A total of 5.29 million viewers (even with the ratings from the previous episode, "500 Keys".) tuned in to watch the season 22 finale. The episode, which asked its 5 million viewers to log on to thesimpsons.com to decide the outcome of the episode, had at the time the fifth-lowest viewership of any new episode in history. "The Ned-Liest Catch" received mixed-to-positive reviews from TV critics, with many complimenting the Nedna relationship, and very positive reviews from fans. Modified on May 11, 2016, at 18:23.